The land on which our church stands was sold in 1894 by Sir John Pender G.C.M.G. 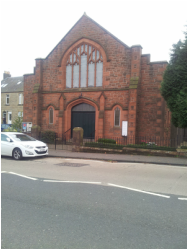 of Middleton Hall to Broxburn Free Church to build a Mission Hall in Uphall. The Free and United Presbyterian Missions in Uphall joined in 1897 and led to the Mission Hall being converted to a “preaching Station” which became a full charge in 1898, appointed its first minister and took on the new name of Uphall Free Church. On 26th Jan. 1897, Uphall Mission was erected into a “Preaching Station” by the Free Presbytery of Linlithgow. Broxburn United Presbyterian Church was also carrying out mission work at Uphall. However, a decision was taken to discontinue this Mission work, and to unite with the Free Church. The Free Church Session reciprocated by asking for a recommendation of one of the students finishing at the United Presbyterian College to take charge of the Preaching Station. Mr. George Millar was sent. 61 members were transferred from Broxburn Free congregation , and a few members from Broxburn United Presbyterian congregation, to form the nucleus of the new congregation. The result being, in Uphall there was a United Free Church before the great Union of 1900 created the United Free Church of Scotland. It also meant far more, for it meant that the members of the United Presbyterian Church became, for the first time, members of the Free Church. Next year, 1898, the General Assembly sanctioned Uphall as a full charge. A unanimous call was given to Mr. Millar, and his ordination took place on 2nd Aug. 1898. By that time the membership exceeded 100. The nationwide union of the Free Church and the United Presbyterian Church in 1900 meant that the church then became Uphall United Free Church. By 1926 the congregation had outgrown the existing premises and the present day building was erected in front of the old one which became the church hall. Finally In 1929 the nationwide union of the United Free Church and the Church of Scotland led to the church becoming Uphall South Parish Church. The church followed the path of most with membership peaking in the fifties and sixties at around 400. There followed a marked decline during the latter years of a long ministry and when this tenure ended in 1992, after much consideration a reviewable 5 year tenure was granted. Thanks to the efforts of the incumbent minister and a very faithful core group, to the surprise of those outwith the congregation and with God’s grace the church began to flourish again. So much so that an unrestricted call was supported in 2000 and our most recent minister continued the remarkable revival of Uphall South through to her departure in 2011. We are friendly, welcoming and enjoy sharing fellowship together after Sunday worship. This year we have had a Soup Lunch, a Jubilee tea (provided by Craft and Chat), Mothers Day teas (provided by Sunday Club), and a Fathers Day sausage sizzle (provided by US Men). US Men meet monthly and enjoy walking, talking, eating, bowling, snooker, theatre, games but mostly good company. This is an opportunity for the men of all ages to socialise and get to know each other in an informal relaxed setting. Craft and Chat allows the ladies of the congregation to come together over a cup of tea to have blether and knit, sew, make cards, crochet. They meet monthly throughout most of the year and weekly over the summer. There are many other teams and groups involving most of our congregation. We are also a Fair Trade and eco-friendly congregation and have recently introduced the concept of a ‘Rights Respecting Church’. Sunday Worship in US can be lively or meditative, noisy and active or quiet and reflective. The main service takes place in the Church building from 11am-noon. Praise is led by our organists or Praise band. There are 2 organists who play on a rota system and a Clavinova is used. Twice a month the Praise band (made up of keyboard, guitars, violins and wind instruments) play to lead worship. A variety of music, traditional and modern, makes up our praise. We have no set hymn book and use many different sources of Christian music. PowerPoint is used to display the hymns, intimations and other parts of the service as desired. The choir lead the praise in church, occasionally singing an introit. New praise is introduced on a regular basis. Members of the congregation read the Scripture passages each Sunday. They also deliver the intercessory prayer on the second Sunday of the month, whilst the children contribute their prayer on the first Sunday. Currently, the children and young people join the church family for the first part of the service and then leave to go to the Church hall and the neighbouring café (The Open Door, run by the BASICS Trust) to meet in Sunday Stars or Sunday Club. There is a well-established Worship group in the Church, which reports to session. One of their roles is to organise the monthly Family service which can be taken by one of the Church groups (prayer group, Bible study, Guides etc). Our family service is on the fourth Sunday of every month tending to be shorter and is followed by a time for fellowship (tea/coffee) in the church hall. Communion is celebrated monthly (with a full, formal communion 4 times a year), and a family communion traditionally takes place during our April family service. There is a monthly evening service in the Community Hall, Dechmont, which is part of our Parish. In the summer months, we have an early morning, informal service in the church hall in addition to the regular service. This has been well attended over the last few years, is set out café style, with breakfast being offered some mornings. Tea and coffee is available between services ensuring shared fellowship. Special services take place throughout the year e.g. for those who have been bereaved, a Guiding ‘Thinking Day’, Back to school, Holiday Club, Cradle Roll and a Gift service. Prayer is a vital part of our church life. There is a mid-week prayer meeting and a monthly prayer leaflet. Over 50 people pray at home for those who are sick or facing other issues. After each Sunday service 2 members of the prayer team are available to the congregation for prayer support. In June this year we held a 24 hour prayer event focusing on local and national issues. Christian education is seen as an important part of our church life, helping people of all ages in the church family to grow in knowledge and understanding of the Christian faith and encouraging personal spiritual growth. The youngest children go to the crèche until the age of 3 when they join Sunday Stars where they stay until P6. The children are taught using a variety of scriptural resources to help them understand the message. They also take part in family services, sharing with the congregation something of what they have been learning and lift our spirits with the annual Nativity play. The older children from P7 upwards go to Sunday Club where the teaching is more theme based and includes discussion about the practical application of faith in Jesus to daily life. Approximately 35-40 adults are involved in 4 Bible study groups learning together and supporting one another. Alpha has often been the catalyst to promote further exploration of their faith, the Bible and its relevance in the world today. Courses are also offered to people seeking to have children baptised and those wishing to become members by profession of faith. During the service on the last Sunday of December (or the first Sunday in January), an Act of Remembrance is incorporated into the worship for those who have been bereaved during the year. Invitations are sent to the bereaved families in the parish who have had a funeral conducted by our minister. We have Open Church on the 1st Saturday of the month for prayer and reflection. In 2011 and 2012 we also had the church open for personal prayer and reflection on Good Friday between 12 noon and 3pm. In December 2011 we had an additional open church on the Saturday preceding Christmas. A 24 hour prayer event was held in June 2012. We are represented on the local Council of Churches (6 local congregations) which organises a variety of community outreach events. These include an annual pulpit exchange, Lent Bible study series, Holy Week services and a Christmas torchlight procession followed by a carol service. The congregation of US enthusiastically supports these events. The Council of Churches also arranges a rota to lead services in the care homes, nursing homes and sheltered housing complexes in Uphall and Broxburn. US have 4 teams of Elders and the minister who share leading worship at these services. We have a Care and Friendship group whose remit is to ensure that the pastoral needs of those requiring care and friendship in church and the community are met. The group has set up a monthly “Cuppa and Chat” meeting and transport is arranged for those who require it. The Care and Friendship group have also organised regular “reminiscence afternoons” at two of the local care homes. We are an active partner, along with other local churches and Scripture Union, in the BUSY Project (Broxburn, Uphall South and Strathbrock Young People’s Project), with representatives on the management team. This project employs a full time Christian youth worker, to work with young people from P7 upwards in schools, the community and the local churches. There is a special focus on vulnerable young people. It is entering its 8th year, and has funding for a further 2 years. The Project is supported by individuals making regular financial donations, praying and volunteering to help with activities. US members are part of a chaplaincy team in Broxburn Academy along with the youth worker. There are many opportunities for the team to work in Broxburn Academy. The local schools greatly appreciate the work done by BUSY and the added pastoral care resource it provides for vulnerable pupils. There are also weekly outreach events for the community. You can find further information from the BUSY website at www.thebusyproject.org.uk. The local churches have good access to all the local schools. At present our chaplaincy work in Uphall Primary and Dechmont Infants is led by a member of the congregation. Members of the congregation also volunteer at the SU Light Clubs in the local primary schools. The primary schools come to the church for their end of term services, alternating between US and Strathbrock Parish Church. We run a week long summer mission jointly with Strathbrock Parish Church in August. This attracts 50 - 70 children (P1 to P7) each day. The parish of Uphall South (US) takes in part of Uphall to the south of the main street, the villages of Dechmont to the west, Uphall Station to the south. and extends east into the south westerly part of Broxburn. There are approximately 2500 households in the parish with about 7000 people. The population within the parish is growing, as it is throughout West Lothian, with substantial new development proposed for Uphall and Dechmont. Many young families have moved into the area because of the competitive cost of housing and the ease of travel to Edinburgh and Glasgow. The community is just ten minutes from Uphall rail station, fifteen minutes from Edinburgh Airport and is close to the M8 and M9 motorways. It is much more than just a dormitory area however, as there are many residents with family links going back decades and further. This results in a strong sense of community and continuity. The housing is a good mix of private and local authority stock ranging from late 19th century to current new builds. Within the parish and wider community there are 2 primary schools, an infant school and the secondary school associated with them. Also in the area are 3 nursing homes, 2 care homes and 3 sheltered housing complexes catering for vulnerable people in the community. There is a wide variety of small businesses in the main street serving the needs of the community, including 2 hotels and 2 B&B’s for visitors to the area.